I am one who firmly believes the pen is mightier than the sword. Consequently, I have a fully stocked arsenal with every pen and pencil imaginable. I look with a jaundiced eye at the person who is ill equipped with writing instruments. I am fully prepared at all times with the exact pen or pencil needed. I suppose there are those who feel that a pen can be used for everything. Sort of a jack-of-all-trade writing instrument. Each pen and pencil is designed for a specific job. That is the way I feel about it. My collection of pens and pencils is quite extensive. 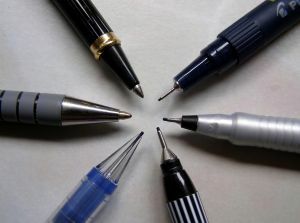 Moreover, I am always on the lookout for a new pen. After all, you cannot have too many pens. On my dresser in my bedroom is a large selection of pens and pencils for me to choose each morning. I have enough that I do not have to use a pen or pencil two days in a row. Some people have a closet full of shoes. I have a dresser full of pens. I think pens are much more useful than shoes. Back in my office on my desk is another assortment of pens and pencils. Within easy reach anytime of the day or night I have a selection of pens and pencils to choose from, which gives me a good sense of security. My shirt pocket always has a nice assortment of pens and pencils to choose. No matter where I am or what I am doing is always a need for just the right writing instrument. There is nothing more frustrating than not having the proper writing instrument when you need it. So, my motto is, never leave home without them. More than once the Gracious Mistress of the Parsonage has threatened to get rid of some pens. "This pen doesn't even write," she often complains, and then threatens to throw it away simply because it no longer writes. If the pen no longer writes, it should be tucked away in a drawer where it can rest the remainder of its days in peaceful quietude. Years ago, I made a vow, "Until death do us part." And I will not part with my pens until I die. For a long time I thought I was the only one with this, which my wife calls, obsession with pens. I believe the word obsession is a little strong. I just like pens. Then my wife and I had lunch at a restaurant across town. And I was in for a delightful surprise. The host seated us and gave us a menu to peruse while we waited for our waitress. I was expecting just a normal noon repast at this little diner. But I was in for a wonderful surprise. The waitress finally came to our table to take our order and I was delightfully amazed. I'm not sure what she looked like. I cannot recall the color of her hair or if it was long or short. I could not tell you what she was wearing except for one thing. Around her waist, was a little apron filled and stuffed with pens of every description imaginable. My eyes were glued on that magnificent sight. I was so mesmerized by the sight that I could hardly order my lunch. I could not refrain any longer and so I had to put forth my query. "Where did you get all those pens? I love them." "Thank you. It’s quite a large collection, isn't it?" "How many pens do you have?" She thought for a moment and then said, "I'm not sure, but I don't think you can ever have too many pens." I sighed a heavy sigh and finally was able to give her my order. When she whirled away, I looked at my wife and said, "Now, there is a waitress after my own heart." As always, my good wife knew what I was thinking. She looked at me rather sternly and said, "No, we cannot adopt her." It is rare that you find someone who was almost obsessed about something as you are. Every time this delightful little waitress came back to our table, we always have a wonderful conversation about her pen collection. I was not surprised, but every pen she had seemed to have a little story behind it and she was eager to share the story, almost as eager as I was to hear it. Some people think that pens write stories. There are a few of us who know that every pen has its own story. The pen lover somehow clicks into that story. "This is my favorite pen," she said to us towards the end of our meal. "My husband gave it to me on our first wedding anniversary." I'm not sure, but I think I detected a wee bit of emotion in that confession. When the bill came and we got ready to go I hit upon a wonderful idea. I pulled a napkin aside and wrote on it. "Here's your tip, sweetie." Then I selected one of my favorite pens and put it on the napkin and under the pen, I slipped a five-dollar bill. The Bible says, "To every thing there is a season, and a time to every purpose under the heaven” (Ecclesiastes 3:1 KJV). Knowing that I have a purpose in life is wonderful, but knowing that purpose is more wonderful.